In another edition of these interviews, we introduce you to Teresa. 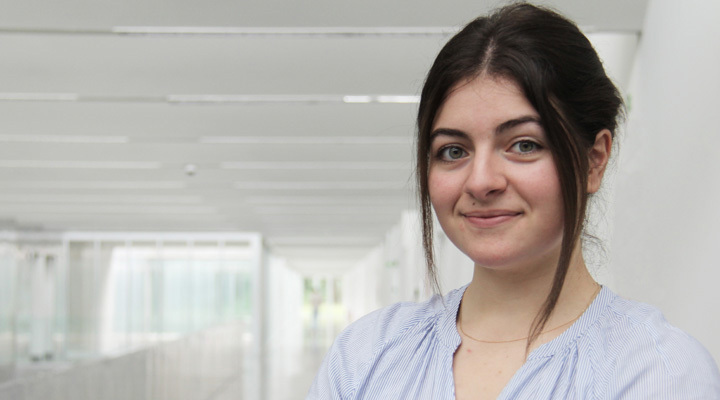 Book lover and interested in astronomy, this young woman from Vigo has been living in the impressive landscape of Scotland for five years, where she studies a Bachelor’s degree in Philosphy and Mathematics (University of Edinburgh). She is currently doing her summer internship in the Intelligent Network Systems (INetS) area at Gradiant and in her free time she enjoys swimming or dancing, although she has always been a horse-riding fan since she was a child. Like any other kid, I have gone through different stages, some of them quite peculiar; from being a professional horse rider, historian or philosopher to being a physicist and finally a mathematician. Actually, I have not decided whether I want to pursue a career in technology or not yet, although I am very interested in research as a whole. I see my internship in Gradiant as a magnificent opportunity to explore the area of technology among all of the different possible paths that my degree offers. At the moment, I am working on the Machine Generated Data Analytics line of the INetS area at Gradiant, learning about the fundamentals and applications of algorithms based on decision tree assemblies to solve regression and classification problems. These kinds of techniques are very useful in cybersecurity to automatically detect computer network intrusions and attacks or to predict machine failures on a manufacturing line in industry 4.0 organizations. I enjoy being able to discover new fields where I can apply my mathematical knowledge, as well as having the opportunity to meet so many professionals specialised in different areas, which is very enriching. I also like the work environment that Gradiant has. I am fond of Dorothy Johnson Vaughan, an afro-american mathematician and theoretical technologist, who worked for NACA (National Advisory Committee for Aeronautics) and NASA, where she stood out in the West Computing program, as well as in the Analysis and Computation Division (ACD). I recommend the movie ‘Hidden Figures’, based on Margot Lee Shetterly’s book, where Dorothy features, alongside with other important women in the STEM fields. Nowadays technology is fundamental in any scientific field. I would like to be able to work applying mathematics to science having a strong technological background. I see myself using my mathematical knowledge for research. I would encourage them; firstly because they show curiosity for an area of knowledge that not only is dynamic, but also in constant development, and moreover technology is one of the pillars of progress in so many fields, and everything relies on it. I have realised that there is a wade range of possibilities for anyone that pursues a technology career.